Modern travellers and commuters heavily rely on their mobile phones for business and pleasure whilst travelling. Aircharge wireless charging connects you with consumers in search of charging facilities and drive them to your location. Aircharge is the first and only brand in the world to provide a railway certified wireless charging solution for rolling stock. Aircharge wireless charges can be found on board of trains and buses. Aircharge wireless chargers offer the safest and most convenient solution to keep mobile devices powered and connected without having to rely on finding power outlets and carrying cables, adaptors or power banks. Just like people expect Wi-Fi everywhere, now they expect to charge their phone too. 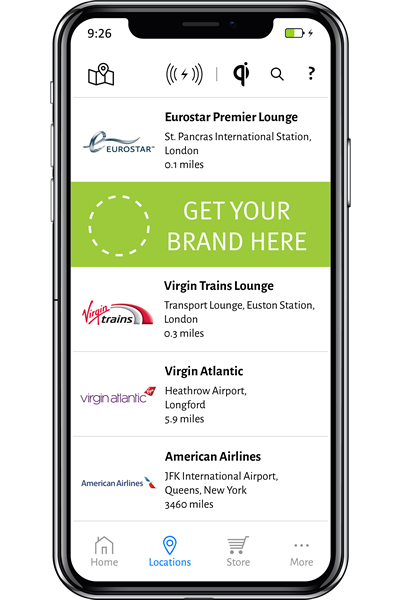 The Aircharge app allows users to locate the closer wireless charging locations and select their favourite brand to visit. Allow your customers easy connection to Wi-Fi, send the latest travel updates or push notifications and offers directly onto their mobile phone. From airports and train stations to air carries, bus manufacturers, train operators and smart cities, the most renowned brands in the transport sector are deploying Aircharge wireless chargers to redefine and enhance their mobile experience.